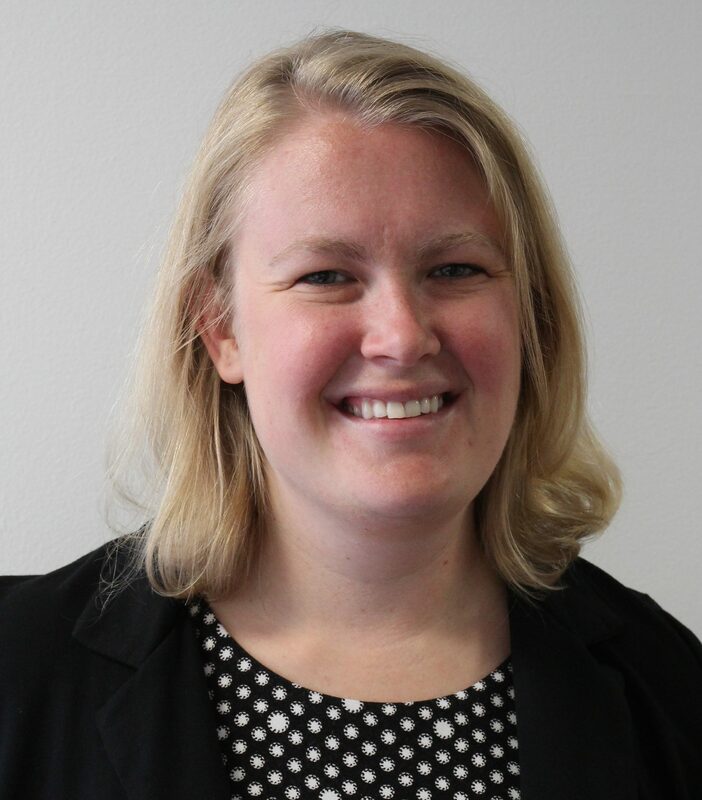 Digging In: Women in Agriculture | Econsult Solutions, Inc.
Last week, during yet another Nor’easter, I found my mind wandering to summer weather – and the fresh produce that comes with it. In order to bide time until the weather improves, I began researching CSAs (Community Supported Agriculture), or Farm Shares, with pick-ups in the Philadelphia area. During my research, I noticed that a high number of farms supplying CSAs were owned or co-owned by women. In order to round out women’s history month on Present Value, I decided to dig into trends of women in agriculture, specifically crop and animal production, and the economics of those changes, at both the national and state levels. I wanted to map the distribution of women farmers and how the percentage of women farmers has changed over time. In order to contextualize this data, I first conducted a high-level SWOT (Strengths, Weaknesses, Opportunities, and Threats) analysis of women in Ag. What I found is that while there are positive trends for women in agriculture – the number of women farmers has grown considerably (from 26 to 31 percent of operators between 2002 and 2012), women make up an increasing share of principal operators, and many women farmers are well positioned to capitalize on consumer demand for local and sustainable foods – ongoing challenges remain. Women primarily operate farms with less than $10,000 in annual revenue, making them more vulnerable to market changes, and face difficulties accessing the capital needed to scale operations. Growing Number of Women Farm Operators: There are nearly 1 million women farmers in the United States, accounting for 31 percent of all farm operators, both principal and secondary. Since 1982, the number of farms with women principal operators has grown from 5 percent to 14 percent. Similarly, in Pennsylvania, women accounted for 30 percent of operators in 2012, up from 26 percent in 2002. In total, the number of women farmers in Pennsylvania grew by more than 20 percent over the 10-year period, from 22,710 operators in 2002 to 27,330 operators in 2012. 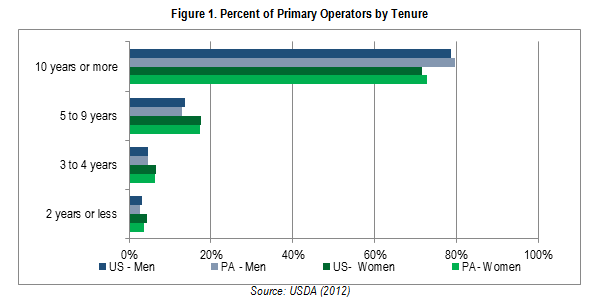 Greater Share of New Farmers: In 2012, women were the principal operators on 18.8 percent of Pennsylvania farms operating for two or fewer years, compared to 13.2 percent of farms in operation for 10+ years (Figure 1). At the national level, the percentages are 18.8 percent for two or fewer years, and 12.6 percent for 10+ years. Product Diversification: The predominant specialization of women farmers is combination crops – that is, farms where there is no single majority commodity and those that specialize in diverse, miscellaneous commodities. Combination crops account for 26 percent of women-owned farms and combination animals rank third, accounting for 22 percent. This product diversification strengthens the resiliency of women-owned farms against market changes. Conversely, 28 percent of all farms specialize in beef cattle, while combination crops and combination animals combined account for less than 25 percent of farms, compared to 48 percent of women-owned farms. 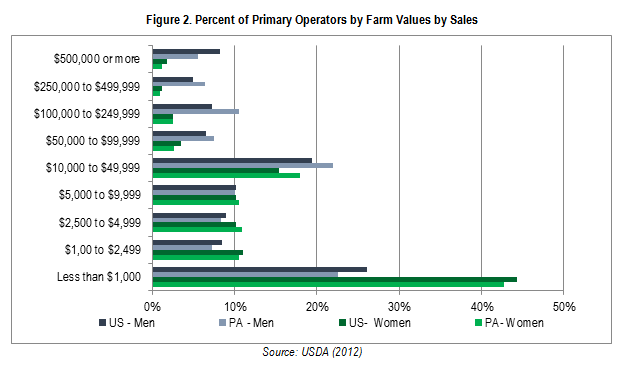 Small Size and Revenue of Women-Operated Farms: The majority of farms with a woman principal operator have annual sales of less than $10,000 / year, while the majority of male principal operators own farms with more than $10,000 / year in farm sales (Figure 2). On average, female-operated farms are less than half the size of male-operated farms – 210 vs. 452 acres. The gaps in farm sales and farm size exist despite the fact that men and women are almost equally likely to have a principal occupation other than farming. In 2012, 57 percent of women principal operators had a primary occupation other than farming, compared to 52 percent of men. Income Equality in Agriculture: According to NRDC, The differences in average farm size and revenue between female and male farmers contribute to income inequality within the industry. In 2012, the average female farmer made only $2,560 / year, compared to the average annual income for male farmers of$42,731 – nearly 17 times higher than the average for female operators. Difficulty Scaling Operations: Women operators, particularly young women, often face financial challenges in scaling their businesses. Difficulty affording the land or equipment needed to scale their businesses can prevent farmers from achieving sustainable growth. Vulnerability to Market Changes: Small farms, defined as those with sales under $10,000 are the most vulnerable to market changes that impact profit margins and farm income. Because women operators primarily work on small farms, they are particularly vulnerable to these changes. Capitalizing on Consumer Trends: Ag economists have identified the shift of local food from a niche to mainstream consumer request, millennial buying behaviors, food as an experience, big data and data-driven technologies, and the nexus of health, tech and food as major trends for producers to consider. Growth in women farmers has been driven by the growing number of women farmers age 25 to 34. These “millennial farmers” are much more likely than the average farmer to have diversified crops, grow organically, and be involved with local food systems. These traits position young, women farmers to capitalize on consumer demand for local, natural foods. In addition, women-owned commercial farms (those with sales of $100,000 or more) are largely concentrated in grains and oilseeds, specialty crops, and poultry and eggs. Poultry and eggs, and specialty crops both have strong market outlooks, positioning women-owned farms in these sectors for continued growth. Alternative Distribution Systems: The growth of women in agriculture has driven growth in cooperative, alternative distribution systems. Direct-to-consumer systems – including farmers markets, cooperatives, and CSAs – offer alternatives for women farmers to sell their products and increase profit margins. Access to Land and Capital: New, young farmers are less likely than previous generations to come from non-agricultural families. As noted, new producers often have smaller operations, and their limited land and capital can create issues in acquiring the additional resources needed to scale operations. However, there are programs available for new farmers to address these issues, including the U.S. Department of Agriculture (USDA) Farm Service Agency’s (FSA) Direct Farm Ownership loans for beginning farmers and ranchers. The FSA sets aside a portion of its funds for women and other historically underserved groups including African Americans, Hispanics, and Indigenous peoples. At the state level, Pennsylvania’s Agricultural Conservation Easement Purchase Program can connect new farmers with prime farmland that has been protected through conservation easements. The Pennsylvania Department of Agriculture and organizations like the Pennsylvania Association for Sustainable Agriculture also offer grants for new farmers. In addition to Pennsylvania’s capital access programs, I wanted to understand women operator trends in the state. Women account for 30.5 percent of the state’s farm operators. At the country level, the percentage ranges from 22.4 percent in Cameron County to 41.9 percent in Pike County. There are strong concentrations of women operators in the Philadelphia region – an area with a significant number of small, direct-to-consumer farmers. In addition, 56 of 67 counties experienced growth in the number of female operators between 2002 and 2012. Change in over the decade ranged from a 15.9 percent decline in Washington County to a 105 percent increase in Montour County. In Philadelphia County, there were no women operators in 2002, compared to 13 in 2012. Conversely, only 35 counties experienced growth in the number of male operators. In 12 counties, the growth in women farmers offset the decline in male farmers, with 49 counties experiencing overall growth in operators between 2002 and 2012. 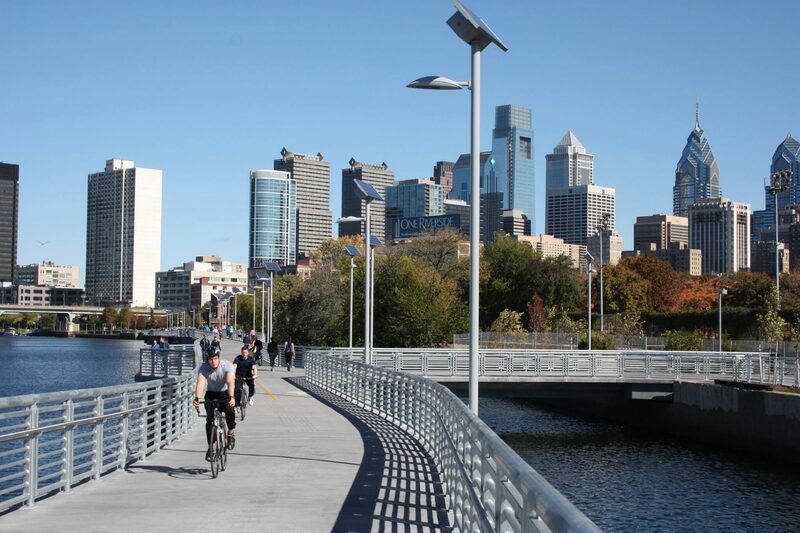 The change during that period ranged from a 20 percent decline in Leigh County to a 220 percent increase in Philadelphia County. In total, the share of female operators increased in 62 counties – due to higher growth rates in women operators and/or lower declines. There are opportunities to further the growth of women in agriculture, towards gender and income parity. However, significant challenges in establishing, scaling, and sustaining farm production remain. If you want to support women in agriculture through alternative distribution systems, you can check out a list of Philadelphia-area CSAs here or search for ones in your area here. This analysis uses the USDA Census of Agriculture. The USDA National Agricultural Statistics Service (NASS) conducts and publishes the Census of Agriculture every five years. The 2017 Census of Agriculture is currently underway, with results to be released in February 2019. I therefore analyzed the most recent USDA Census data from 2012, along with the 2002 and 2007 Censuses to measure longitudinal change.